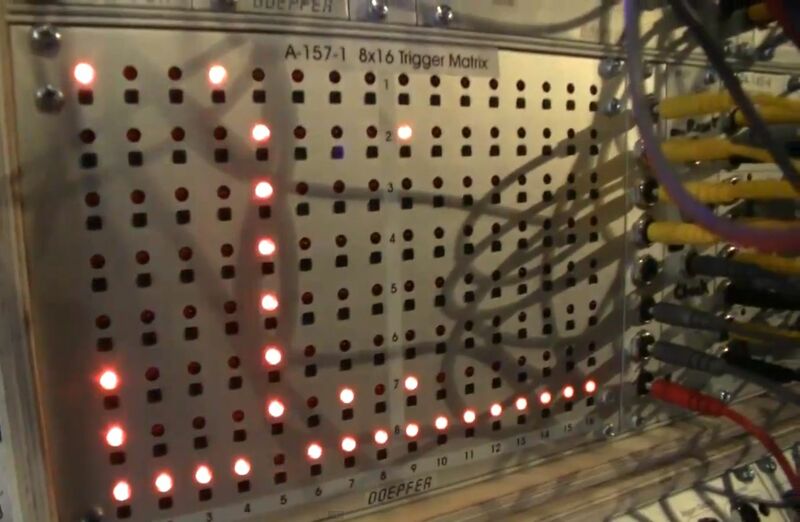 It's weird that i haven't posted any video's of the original Doepfer Schaltwerk sequencer (introduced in 1997) on my blog yet. I thought it would be interesting enough to look up more info about the Schaltwerk and share it with you.
" 3 tracks sequencing a modular synth with cv / gate5 tracks sequencing a midi drum modul (mfb kult)"
As you see there are many differences between the original Schaltwerk and the new A-157/Dark Flow modules. Besides the size, the main thing is that the new modules will only sequence triggers, and no note/pitch info. That's why i think it will be mainly used for triggering drum-sounds with it, that can ultimately result in very complex rhythms once the A-157-4 controller will be out. 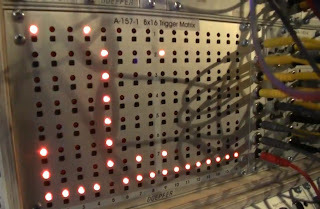 Funny thing is that the A-157 has the same amount of push-buttons (8 x 16 trigger matrix), only on a much tinier surface. That's just another thing that i like about the Doepfer modules; many features on space-effective modules. I am aware that in some cases you can hardly turn a knob if you have big fingers, but luckily I am blessed with small hands and fingers. The original Schaltwerk is no longer available from Doepfer anymore. Sometimes used ones pop up on eBay and other sites, good luck finding a second-hand one... I wish i had one too. ps. There are not many Doepfer Schaltwerk videos on YouTube yet... Feel free to upload more Schaltwerk-videos in the near future if you have one.